Ibiza joined the RESISTANCE for the final time this season for its immense closing party at Privilege. Where did the past nine weeks go? It only seems like yesterday Privilege witnessed an iconic opening party tear-up with the likes of Loco Dice, Seth Troxler and Charlotte de Witte. Ultra brought RESISTANCE to the island last year for a major debut season. This time around, they somehow topped it. It's a credit to Ultra and the RESISTANCE team's commitment to epic production, outstanding music and a genuine passion for partying. This season's RESISTANCE closing party was no different. The final fiesta had it all. It was the perfect wrap-up to one of Ibiza's most popular parties. Coincidentally, earlier that night it had taken home the DJ Award for best Ibiza Night. A packed-out Main Room saw Carl Cox and Maceo Plex share the decks for an extraordinary back-to-back before the big man closed the party and RESISTANCE's second season on the White Isle. Here are 10 of the finest tracks from the night. This one has been doing the rounds in a few of Dixon's sets on the island, which means one thing: banger. Skream rolled it out just as we entered the Vista Club where the atmosphere was electric. 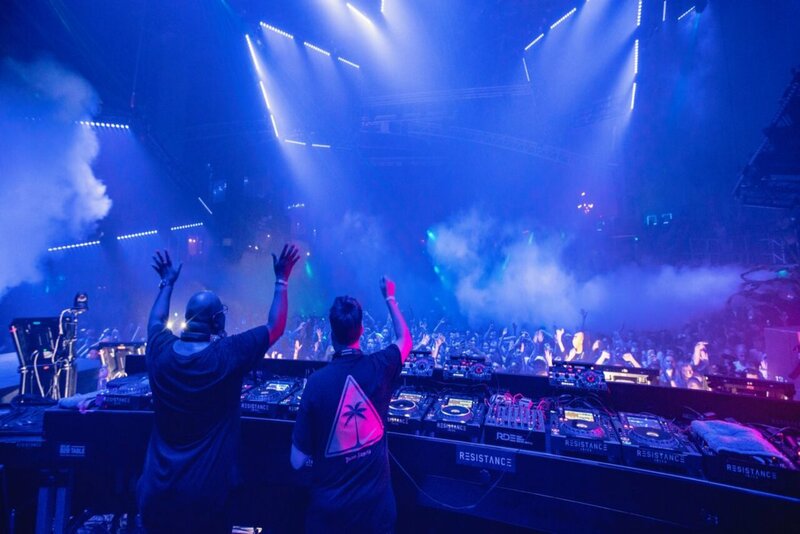 Carl Cox and Maceo Plex pulled this one out early on - anything on our minds instantly forgotten. Any Eric Prydz production is going to have a club like Privilege rocking. The cavernous venue created the perfect environment for this thumping tune. What a moment. Carl Cox and Maceo Plex were in full flow by this point. The set moved from dark and deep techno to burning acid to pumping house. It was an ode to these two legends' musical knowledge. If you missed out, we are sorry. Heavy, heavy, HEAVY! You could feel the 130BPM pierce your chest and pulsate through your body faster than a Japanese bullet train. I had to have a five-minute sit-down after this one. Seriously. This inspiring back-to-back came to an uplifting close with tunes such as this one by Mike Ferreira. At this point, I wasn't sure what I just witnessed. All I know is that it was f***in fantastic. Maceo made way and now Carl Cox was ready to go at it alone. He pumped this one out early on to a crowd full of energy. If your legs, brain or even soul was tired out from hours of thumping techno, it didn't matter. A new one for now but most certainly a classic in the near future. Paul Anthonee's remix of Starkato's We Rise was, for me, the tune of the night. Nothing more said. Coxy loves Drumcode - and you can see why. Adam Beyer's techno stable is packed full of the finest thoroughbreds in electronic music production. Any Enrico Sanguiliano track is bound to send the party into a frenzy. This was no different. Carl Cox's versatility and ability to move through genres is gratifying. He slotted in this perfect deep house cut as the night was drawing to a close. It was an unbelievable moment during a musically perfect night. And that's it for RESISTANCE and Carl Cox this season. It was more than a pleasure to witness such an epic season and closing unfold and then pack-up again for the year on this island. With two seasons under its belt, who knows what's going to happen next year. If Ultra does bring RESISTANCE to Ibiza again, I and many others will no doubt be joining. Listen to Ibiza Spotlight's RESISTANCE Ibiza playlist here.